Samsung is blocking a hack of its S Voice digital assistant software that allowed any Android phone running Ice Cream Sandwich to use the app. 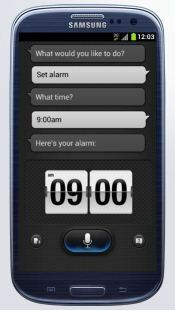 The hack of the app, designed for Samsung's hot new Galaxy S III smartphone scheduled to reach retailers on May 29, was revealed Saturday in the XDA Forum. Since that time, Samsung started blocking the functionality of the app if it's running on any phone model other than the Galaxy S III. Reportedly, phones running S Voice are sending information to the servers that support the software, but the servers, which are run by Vlingo, are ignoring any information requests that don't originate from a Galaxy S III. Such requests produce a "Network Error" message on the handset. Apparently that's relatively easy to do because data strings sent by the app to the servers contain information identifying the phone model from which they were sent. Theoretically, those strings could be spoofed to fool the servers into thinking the data originated with a Galaxy S III. It remains to be seen if the hacker community will produce such spoofing software. Reviews of the hacked version of S Voice were mixed. Some users found functionality limited to search, weather reports, and waking up a phone by shouting "Hi, Galaxy!" One user, though, wrote that the software worked as advertised on a Galaxy Nexus model. S Voice is Samsung's answer to Apple's Siri voice-activated personal assistant. It does much of what Siri does, as well as some things it doesn't, such as turning off an alarm by saying snooze and snapping a picture when you say, "Cheese."